This shrimp food is designed for all aquarium shrimp including the adults and the young. It's also suitable for all species of shrimp and crayfish including the very common Cherry Shrimp and Crystal Red Shrimp. As the name suggests this shrimp foods main ingredient is Nettle which is absolutely packet with vitamins and minerals which are essential for health shrimp to grow. A) Nettles (Stinging Nettle Urtica dioica) alone are one of the most nutrient dense and vitamin rich plants in Europe thus making it a super food, It also contains formic acid which helps to prevent bacterial infections in the shrimp. When you are stung by nettles this is where the sting feeling comes from. B) Pollen is loaded with minerals and vitamins with an added benefit that it actual lasts a very long time unlike other sources of nutrients that tend to decay over time. Pollen is also the perfect size because of the micro grains its made up of for baby shrimp to eat. C) Beta-Glucans which is a immune system mobilizer, what this means in laymen terms is that Beta- Glucans super charge your Immune system to make it work more efficiently, for the shrimp this means less energy spent on fighting disease and more time being healthy and producing babies. C) Montmorillonite clay is rich in mineral content which help with body function of the Shrimp with an added benefit, the Montmorillonite has a high cation exchange rate meaning its able to absorb impurities like toxins and heavy metals from the water. D) Now with added Citric Acid which helps to preserve the food but also helps fight bacterial infections from the inside. see more here Stopping bacterial infections in Shrimp. Remember the old saying " An apple a day keeps the Doctor away " well it turns out there is truth in it. 70% of a shrimps natural diet will include algae so I think its important to include it it all shrimp food. How to use Marks Shrimp Tanks Nettle Mix Aquarium Shrimp Food? Simple add one peice of Marks Shrimp Tanks Nettle Mix Shrimp Food to the tank per 20 shrimp, remove all uneaten food after 2 hours. 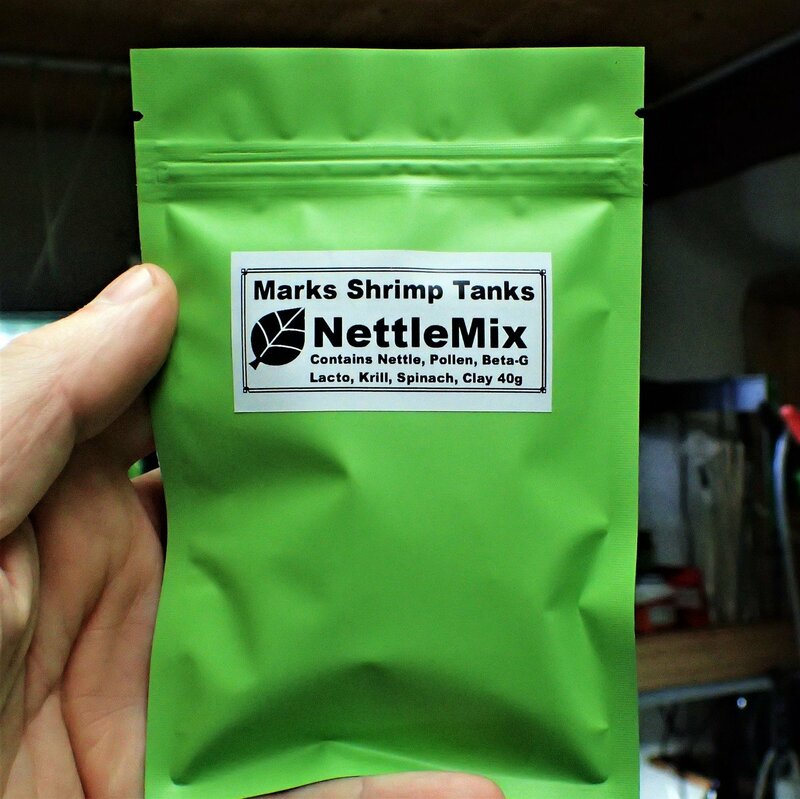 Why Marks Shrimp Tanks Nettle Mix Shrimp Food? When to use Marks Shrimp Tanks Nettle Mix Shrimp Food? As a rule I like to feed my aquarium shrimp food every second day. You also must remove any uneaten food after 2 hours, do not let it sit in your tank and pollute it.